Rethinking our cities; density or size? Will Hutton bemoans the quality of the first London Mayoral debate arguing that the candidates shouldn't focus narrowly on transport and the police, but should address the wider issue of what makes London great and what could make it greater? Hutton highlights two features of cities which he thinks of as crucial to their success - the ability to attract a diverse mix of high quality people and the willingness to house them at high density. He links the first of these issues to immigration, a policy area over which the mayor has no control. The mayor has much more control over density (through decisions made about the London plan) and here Hutton sides with Livingstone who tends to favour more tall buildings as a way of achieving greater density. I have suggested before that the arguments in favour of more tall buildings in London - and some other UK cities - seem pretty compelling (in the sense that the price signals from the market clearly indicate that they would have huge social value). We don't get them for a variety of reasons including, but not limited to, planning restrictions. I'd express one note of caution, however. Hutton assumes that density is key to innovation and the success of cities. But we don't actually know whether it is density or size (or concentrations of particular types of workers or industry) that drive economic performance. Researchers are trying to separate these effects out, but it's difficult because size and density tend to move together. People who like 'compact' walkable cities tend to interpret evidence on density effects as somehow solving this debate without recognising that the effects could come from size. Where does that leave us in terms of buildings in our larger cities? The evidence on positive externalities is inconclusive about whether we should favour density over size . There are negative externalities from building on undeveloped land, but also from destroying sight lines by building up. Overall, the evidence suggests that these externalities may not be big relative to the value of new building (as indicated by the price of new development). That is we should consider both 'up' and 'out' when the price signals are sufficiently strong to suggest the social benefits outweigh the social costs. Last year, my research with Zack Cooper on hospital competition generated a lot of interest. In that work we found that reforms in 2006, which allowed patients to choose between NHS hospitals for routine surgery, had knock-on effects on outcomes in emergency care – lower heart attack mortality rates specifically. A lot of people – those with distaste for the very idea of competition in public services – did not like this finding at all and the arguments ran for some time in the medical press. Our latest research [pdf] is more of a crowd-pleaser. There's something for everyone, both those who support and those who oppose greater choice and competition in the NHS system. In fact, there are headlines drawing on our newest research that spin the message either way. So what does our new research really show? Building on our previous work, we look at the effects of the same policy change in 2006 on patient ‘length of stay’, which is a common indicator of a hospital’s efficiency. Length of stay has been declining over the past decade as surgical and preparative technology and practice improves, and as hospitals have tried to decrease theatre turnaround time, increase patient turnover, utilise resources efficiently and reduce waiting times. The choice policy change in 2006 allowed patients to choose any hospital offering the surgery that they required. This was a nation-wide change, but had more ‘bite’ in places where choice was feasible and facilitated by the local hospital geography than in places where choice was infeasible or impeded. We use these differences to trace out the effects of the policy change on length of stay, by comparing reductions in average length of stay for patients in places of high potential choice with the reductions in places of low potential choice. Just as we found that the switch to a more competitive market structure in 2006 amongst NHS hospitals was associated with reductions in heart attack mortality rates, we find it also led to shorter length of stay for routine operations like hip replacements, cataract and hernia operations. Average length of stay went down more in those places with a lot of potential choice than in places with few potential choices. This was true both for the time spent in hospital after an operation, and for the time spent in hospital waiting for an operation to happen. But is a shorter length of stay a good thing? It is a hospital management target, and reduces costs - but is it good for patients? If hospitals discharge patients ‘quicker but sicker’ after surgery in their haste to free up beds, then clearly not. But a less ambiguous case can be made for the benefits of reducing the time a patient spends in hospital before their operation, especially for routine operations of the type we consider. Preparation for these kinds of operations now takes place in pre-operative clinics before a patient is admitted, specifically to avoid costly delays due to unforeseen complications. The aim is to get patients in surgery on their day of admission to hospital. And our evidence shows that same-day operations became more likely after 2006 in the more competitive markets relative to the uncompetitive markets. This is good news for proponents of competition. There are implied cost savings of around 6 per cent from these length of stay changes, which is a non-trivial amount when scaled up to the NHS as a whole. The bad news is that when NHS hospitals are exposed to competition from private providers things look less encouraging. We can learn about these effects because in 2008, patient choice policy was extended to private hospitals, meaning that private hospitals could offer routine operations to NHS patients (paid for by the NHS). 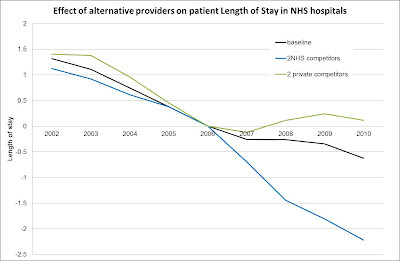 Whereas competition between NHS providers reduced length of stay, competition with private providers tended to increase the average length of stay for patients in NHS hospitals. What could explain this result? The most likely explanation is that private providers could ‘cherry pick’ patients that had no additional complications and were likely to be easier to treat. This resulted in a harder-to-treat case mix in NHS hospitals, with average length of stay rising as a result. In fact we find some evidence that NHS hospitals facing more private competition from 2008 on ended up with older and poorer patients. The general picture can be seen in the graph: length of stay is declining overall (the black line) even in baseline paces with no competitor hospitals. 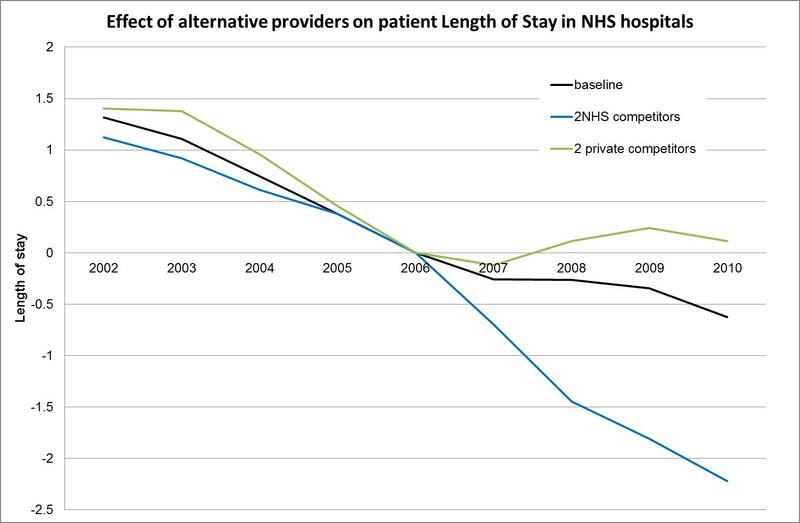 After introduction of choice in 2006, length of stay falls faster in areas where there are more NHS competitors (the blue line).When there are more private competitors after 2008, length of stay starts to increase (the green line) relative to the baseline. Note in this picture length of stay is normalised to zero in 2006 to make the relative changes clearer. So does this mean that private competition is bad for the NHS and is competition beneficial or detrimental overall? This is hard to say from this evidence alone. The main message is that choice and competition amongst NHS public providers seems to have generated some positive incentives and has been a force for improvement. Yet, if private hospitals are to compete with NHS providers under a reformed NHS, safeguards need to be in place to ensure that NHS hospitals are properly compensated for the more risky and challenging mix of cases they could end up treating. A version of this post originally appeared on the LSE British Politics and Policy blog. Is Building Social Housing better than the Benefit Cap? I just read through Left Foot Forward's latest on why building social housing would cut the housing benefit bill three times faster than the benefit cap. The idea of spending 'more on social housing' appeals to many involved in the housing debate regardless of the impact on the overall fiscal position. In addition, LFF suggest that social housing for all 67,000 families affected by the benefit cap would save £8.1bn (way more than the 2.7bn that would be saved by the benefit cap). This sounds like "win-win". Is it? Here's how LFF calculation works. Assume that social housing could house 67,000 families at a cost of £100,000. This gives a total cost of £6.7bn. The Office for Budget Responsibility suggests that spending an extra £1 on infrastructure increases national income by £1 per year (see table C.8). LFF think that 0.65p of that £1 would go to the exchequer in revenues. This means 67,000 homes cost the exchequer £2.3bn. Two crucial assumptions underpin this calculation. The first is the exchequer benefit of 65p out or £1. I don't fully understand where this comes from, but it certainly seems a high figure for the marginal tax take out of output in the UK context. The second problematic figure is the use of the infrastructure multiplier. This is open to dispute on two levels. First in terms of it's overall magnitude. For example, Jonathan Portes of NIESR, talking on the Today programme a couple of week's ago suggested that the infrastructure multiplier was probably closer to 0.7. Second, it's not clear why the infrastructure multiplier for roads, rail and other productive infrastructure should apply to housing. In short, £6.7bn of expenditure on social housing is likely to cost the government considerably more than £2.3bn. The next big saving according to LFF's calculations is in rental payments. They suggest that social housing rents "are much lower [than private sector], perhaps as much as £300 per week". That adds up to £15,600 per family per year and a whopping £8.1bn over 10 years. LFF don't give a source for these figures but they, again, seem pretty high. According to DCLG, private sector rents in London average £198 per week (see table 715 of live tables on rents etc). In London, registered social landlords charge about £85 per week (table 715 again). These figures aren't a like for like comparison (as the underlying portfolio of properties differ) so they exaggerate the difference that would apply to equivalent properties. In short, savings of £300 per week (or £15,600 per year) for moving families from equivalent private sector to social sector flats seems a tall order (although it's hard to understand exactly what calculation LFF are making). Finally, LFF assume that the land comes free from Local Authorities. That ignores the cost in terms of the large capital receipts that LAs could get from selling off valuable land (which the government is just about to let them realise through land auction pilots). In short, there is an argument to be had about social housing provision, but it's not obvious that 'huge fiscal savings' are a big part of that argument. I have been reading that National Trust 'Inexpensive Progress' report on the planning system. It's a little hard to know what to make of it (for reasons discussed below). But let me be generous and suggest that overall I think it represents two steps forward, one step back. I summarised my overall position on the planning system in a post on the proposed reforms in March 2011: "Planning delivers many benefits, but it is also costly (in terms of resources to implement, the way in which it affects costs of living, its negative impact on economic growth). Many would argue, myself included, that we need a serious debate about whether these costs now outweigh the benefits and whether reform is needed. Depressingly, I am deeply skeptical about whether or not we are going to get that serious debate." This scepticism was well placed. As the debate has proceeded people continue to imply that we have no evidence on the costs of the planning system. This is simply not true as Max Nathan and I explained in our policy paper on 'What we know (and don't know) about the links between planning and economic performance'. The National Trust's 'inexpensive progress' report considers a number of these costs in detail and doesn't strongly refute the evidence that we suggested underpinned them. Overall, then, I take the report as recognising many of the costs that we argued were being ignored in the debate. This feels like progress - hence two steps forward. So, what's not to like about the report? Let's set aside the fact that it underplays some of these costs (for example in the discussion about the benefits of bigger places which focuses on static benefits to existing residents). The much bigger problem is that while the report acknowledges all of these costs the National Trust continues to suggest that the many benefits of the planning system likely outweigh them. Note, by the way, that I don't have a problem with the idea that the planning system delivers benefits and that these could outweigh the costs. Campaigners are perfectly entitled to argue that these are prices worth paying to 'protect the countryside' or achieve other policy objectives. So, it's not claims about the existence of these benefits that troubles me. Rather, it is the assertion that we don't have much evidence on them and that, therefore we shouldn't reform the planning system until we have such evidence. Just as with costs, we have plenty of evidence on the benefits of the planning system. For example, economists have performed many 'hedonic studies' using house prices to figure out the value of many things delivered by the planning system. Further to this, the government has just spent many millions of pounds on the National Ecosystem Assessment that tries to get at the non-economic value of undeveloped land. So, in terms of the aspect of the planning system in which the National Trust is most interested - the non-economic value of undeveloped land - we have a signficant body of evidence (collected at far greater expense than the evidence on costs). The National Trust report does mention these studies, but downplays their significance in terms of informing us about the cost and benefit tradeoff of building on more undeveloped land. Why is that, I wonder? Could it be because for a lot of undeveloped land those measured non-economic costs are just way too small to justify the decision to prevent development? I am all for a planning system which compares the broad social value of preserving undeveloped land to the broad social value of building on that land and makes decisions accordingly. On the balance of the evidence that we have available that would lead to lots more development on low social value agricultural land at the fringes of our cities. It would also preserve lots of beautiful English countryside that has high social value. There is certainly an argument to be had on whether or not the government's planning reforms achieve that balance. But the case for the reform remains compelling when the evidence (on both costs and benefits) suggests that the current system is too restrictive to achieve that balance. I have been doing some research (with my colleague Giulia Faggio) looking at the impact of public sector employment on local labour markets. Looking at changes in Local Authority public sector employment from 2003-2007 suggests two things. First, at least during that period, we don't find much evidence of crowding out in terms of overall private sector employment. Second, public sector employment appears to have a multiplier effect on local service sector employment but an offsetting crowding out effect on manufacturing employment. In some ways, this isn't that surprising. Public sector employment creates demand for local goods and services. At the same time, public sector employment creates a supply distortion that hits local firms (and is more pronounced the bigger the public sector wage premium). For services, the demand effect appears to outweigh the supply effect. The demand effects for local manufacturing are much smaller (because the public sector and its workers don't demand much from local manufactruing firms). As a result, for local manufacturing, the supply distortion dominates. As I said, the result isn't that surprising but what is surprising is that it doesn't appear to have been carefully documented before. This raises a question about existing research on the impact of the public sector on local labour markets. So far, we have tracked down the following: some material from the states looking at the impact of specific pieces of public sector employment (particularly the closure of military bases); UK research from LSE colleagues and others on the impact of national pay on public sector service quality (negative); UK research from IFS and others on the extent of the public sector pay premium (pretty big except for males in the south east). We would be very grateful for any pointers on additional material. For various reasons, this kind of question isn't considered much in the huge literature on regional input-output models. There's also some broadly descriptive stuff on previous government relocation. However, what we are after is references to research that tries to get at the causal impact of public sector on local labour markets. Very grateful for any suggestions (either as comments below or email to my usual address). Recessions mean bankruptcies, and bankruptcies in the retail sector mean boarded up high streets. Between 2008 and 2010 the number of empty shops has gone up five fold. Only one shop in 40 was empty in 2008, but the rate is now one in seven. It is higher still in some places - one in five in the North West as a whole, one in four in Blackburn, Grimsby, and Walsall, and one in three in Margate. Does this mean that we should 'let the high street die', as a comment piece in this week's FT suggested? It's true that both cyclical and structural factors are stacking up against retail premises. But just as Portas pilots won't solve the problem alone, a laissez-faire response would not be helpful either. In a market economy prices adjust: rents fall until shops are cheap enough that new businesses become economic. That is happening a bit: the FT states that rents on renewed leases in struggling regional cities typically fall 30 percent . This has been sufficient to stabilise vacancy rates since October 2010. One landlord interviewed said: "The common cry from retailers is halve the rent, or we're off". The market is working, if slowly and sluggishly. In many ways the retail market mirrors the job market. Unemployment rose initially, but has broadly stabilised since. What is worrying is that, like unemployment, there may be structural factors which mean that some shopping areas will never come back. The last 50 years have seen a big shift in labour demand away from the low skilled, and towards the highly skilled. The wages of manual workers have fallen relative to graduates and footballers, but we are still left with a lot of people who are out of work even in good economic times. The same seems to be happening in retail. On the same day that the Financial Times reported that high streets in poorer areas were struggling, it also reported that Ferragamo agreed a new record high rent - almost £1,000 per square foot per year - for its shop in Bond Street. Bond Street is Champions League retail. Margate and Grimsby are not. Policymakers need to be realistic. I bought a set of Tefal pans from Amazon recently. I could have bought them from Argos, or John Lewis. I expect that they were cheaper from Amazon, but I didn't check, because the convenience of Amazon outweighed any likely saving. That part of the high street is all but dead. In contrast I imagine that people who buy Ferragamo leather goods want to see them before they buy them. They sell wallets for £725, and handbags for over £1,000. Retailers selling these items need retail space, and it needs to be near the people with money. The answers in labour market policy are clear: we need to increase skill levels, so that there are fewer unskilled workers who find it hard to get work, however determined they are, and more graduates who find it relatively easier to be employed. For retail, we can draw similar conclusions. Prices adjust in a market economy to give a signal to entrepreneurs about what to do more of, and what to do less of. The signals are clear: we need to provide more shopping space in high end venues, primarily in London, and less space in places where there is little demand. Tim Leunig is chief economist at CentreForum, the liberal think tank, and a reader in economic history at LSE. A version of this post originally appeared on the CentreForum blog. I am not sure what to make of the Portas Pilots. The government competition will see 12 "winners benefiting from a share of £1 million to help turn around their unloved and unused high streets." The amount of money is fairly small, but the scheme does seek to implement some of the better recommendations from the Portas Review (those concerned with the management of high streets). Given the small amount of money available it's presumably important that government learns the maximum amount possible from the pilot. According to Grant Shapps we need to "try new things, experiment [to learn] lessons and help communities across the country breathe new life into their own towns." The issue, of course, is that we don't know what, if anything will work. As I have discussed before, most government evaluations don't allow us to learn lessons about whether policy works, because we don't know what would have happened in the absence of the policy. The Portas Pilots are likely to provide another example if government officials use a whole lot of criteria to select 'the very best bids'. If high streets in the pilot area then do better how do we know if this is anything to do with the Portas process? Perhaps these areas were doing a good job on lots of other policy areas (remember they were capable of writing the 'best bids') and the high streets happened to benefit as a result of that and not the Portas process. Alternatively, perhaps they would have done many of these things anyhow, without the government providing them money. In addition, to these concerns about assessing the impact of the pilots, it is worrying that centralised rankings of bids may have a tendency to kill the very experimentation that government says they want to create. If government wants to be truly innovative on Portas pilots then there is a way to solve this problem. Assuming that the government gets lots of good bids why does it need to try to pick 'the very best'? Why not, instead, just pick a random selection of 12 bids from all of those that seem good enough to get funding? Randomness helps solve the selection problem so that we can learn more from the pilot (by comparing the lucky winners to the unlucky losers). It will encourage creativity because bidders will not be trying to guess exactly how officials will rank bids. It will also save on central government resources in having to produce those rankings (which is a pretty difficult task anyhow given that we don't know what works). There's a cost, of course - ministers will feel like they have less 'control'. But given the uncertainties about what works this 'control' is an illusion anyhow (at least in terms of the economic impact). In short, in keeping with the overall philosophy, some experimentation in the selection process might help us learn a lot from the 'Portas Pilots'. Interesting to see the call for a new 'northern assembly' to help tackle the north-south divide, partly inspired by the observation that the recession appears to be increasing that divide. Here's my blog post from a couple of months ago talking about why the divide is increasing. In short, a lot of it is to do with the fact that the lower skilled workers are getting hit hard everywhere. The north has a higher proportion of lower skilled workers, so it's getting hit harder than the south. But lower skilled workers in the south are doing pretty (equally?) badly too. Against this backdrop, would decentralisation in the form of an elected northern assembly help? As I have said before, there's precious little evidence to back up this assertion. If you are interested in reading further, Max Nathan discussed some of this a couple of weeks ago in a post on city deals (and you can find more details on the evidence in this older policy piece). I wrote yesterday about our research showing that government grants to smaller firms in economically disadvantaged areas of Great Britain can increase employment, but that grants to larger firms are wasted. I confess to being surprised by this result. My starting position was that all this money was wasted because firms would have gone ahead and done the investment even if they hadn't received the money. Our results suggest that this is not the case, at least for smaller firms. Does this mean the government should be providing much more support to smaller firms in disadvantaged areas? Personally, I don't think our results should be interpreted in that way. The programme that we studied, RSA, was targeted at firms that served national or international markets. I suspect that this is one of the reasons why we do not detect much displacement (where jobs at supported firms just replace jobs at nearby unsupported firms). However, many smaller firms serve local markets and I would expect support to those firms to mostly generate displacement. Findings from preliminary work on another government scheme (Local Enterprise Growth Initiative) support this assertion. Specifically, we are finding that support from LEGI, which mostly went to small firms serving the local economy, only generated displacement (and that over quite small distances). There appears to have been no impact on overall activity so money to both small and large firms was 'wasted'. Further, as discussed yesterday, RSA didn't seem to have much effect on productivity, so it increases the employment share of weaker firms. Such firms are vulnerable to future shocks so its not clear whether this represents a long term solution. Our analysis also ignores the impact that taxation to fund the scheme might have on firms located outside of eligible areas. In short, as usual, careful empirical evaluation cannot necessarily answer all the questions about a policy and more research is needed. But one central message does emerge: If the government is to have these type of investment subsidies, it seems clear that targeting smaller firms would be much more cost-effective. The Great Recession has brought industrial policy back into fashion. Huge subsidies have been granted by governments around the world to private firms most dramatically in financial services, but also in other sectors like autos. Despite the ubiquity and cost of such schemes, rigorous evaluations of the causal effect of these “industrial policies” are rare. In a recent paper, (co-authored with Chiara Criscuolo, Ralf Martin and John Van Reenen of the CEP) we provide some of the most rigorous evidence to date on the impact of one such policy – Regional Selective Assistance. Our research analysed the impact of expenditure on the Regional Selective Assistance programme over a 20-year period. We had access to every grant and examined every manufacturing plant in England, Wales and Scotland – over 2.3 million observations – before and after receiving government support. The main factor holding back credible evaluations of industrial policies is the absence of a clear identification strategy (i.e. a way to figure out what would have happened in the absence of policy). However, because European Union law changed over this 20-year period, some parts of Britain became eligible for subsidies and others saw their grants disappear. This enabled us to work out the impact of investment subsidies on firm performance by comparing similar firms that only differ in terms of their changing eligibility for treatment. We were able to assess the impact of RSA on investment, employment and productivity. Our findings suggest a large effect of grants on recipient firms: a 10% investment subsidy causes about a 7% increase in employment with about half of this (3.6%) arising from growth in existing firms and half from firm entry. These effects are underestimated if analysis ignores the fact that the participants in the scheme are firms and areas who would otherwise perform badly. As I highlighted above, these positive employment effects are confined to smaller firms (e.g. with under 150 workers) possibly because larger firms are more able to “game” the system and take the subsidy without changing their investment and employment levels. Another possible explanation is that grants help remove the financial constraints faced by smaller firms. The wider impacts on employment and unemployment at the area level suggest that positive effects at the firm level aren’t just about a shuffling of jobs from nearby firms who don’t receive financial support. In fact, the new jobs created appear to come mostly from the pool of unemployed workers in the area, which is encouraging in terms of welfare (the cost per job is around $6,330). Overall, then, our results are mixed news for advocates of firm level grants to turn around disadvantaged areas. While these policies can increase area level employment, they have no impact on productivity, leaving firms in this area vulnerable in the future (which may partly explain why firms and areas keep coming back for more support). As always with these types of policies, careful economic analysis suggests there is no free lunch – firm grants can raise employment, but at a cost in terms of productivity which goes beyond the purely financial implications of supporting investment in the first place.